Once again, MCT Events Management will stage the 8th MegaBrands Sale on June 27-29, 2014 from 10am to 9pm at the Megatrade Hall 2 & 3, 5th Level, Mega B, SM Megamall with its bank partner, RCBC Bankard. Soft Selling starts on June 26, 2pm-8pm, to catch the first wave of sale items. 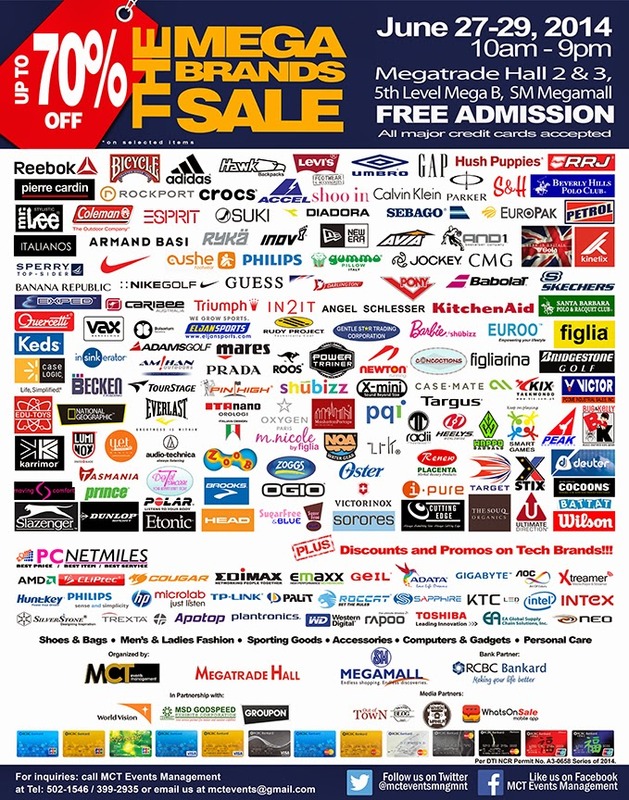 This 3-day Mid Year / Back to School Sale will showcase more than 120 leading brands, both domestic and international. Price cuts are up to 70% discount from shoes, bags, men’s and ladies’ fashion, sporting goods and accessories, personal care, gadgets, computer parts and accessories. Some of the participating brands are Nike, Adidas, Reebok, Rockport, Levi’s, Roos, RRJ, Petrol, Philips, Rudy Project, Ray Ban, Coleman, Hawk Bag, CMG, Figlia, Sebago, and many others will surely delight the shoppers with their offerings and promos. RCBC Bankard cardholders are also in for a treat! You can enjoy 0% interest for up to twelve (12) months on your purchases at the 8th MegaBrands Sale. Groupon Philippines will also offer exciting promos and give-aways to every shopper who will visit their booth during the 3-days event. For more details about the event, please call 239-3807/ 502-1546/ 399-2935 or email mctevents@gmail.com. You may also follow them through Facebook Fanpage: www.facebook.com/MCT-Events-Management or in twitter: @mcteventsmngmnt for more updates on this event.